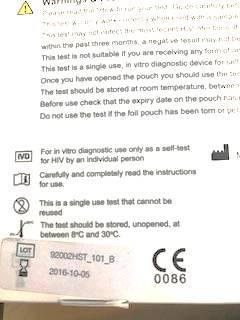 We can reassure you that the BioSURE HIV self‑test kit used in the SELPHI are licensed by the MHRA for use in the UK. The unreliable kits which have been seized by the MHRA did not have a valid CE mark. The SELPHI kits have the CE mark (shown in the image on the right) which means they comply with European health and safety regulations. The tests used in SELPHI are specifically designed to allow a person to take their own test and read their own results. If you do have any concerns about the HIV Self-tests used in SELPHI, please do not hesitate to contact us.